� Here's where the whole thing starts. � How Vivian gets her name. � And then someone crashes into me. � I order a 1:25 scale replica of my car. 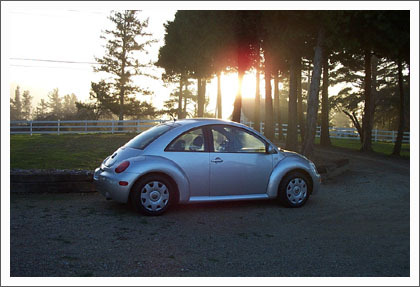 � A photo of the dog and my car. � A photo of my car and a rainbow, almost exactly one year ago. � I talk about the 'low fuel level' beep that still scares the heck out of me. Proof, once again, that I'm a little too emotionally attached to my car.